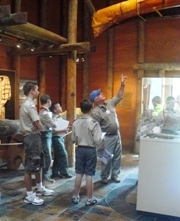 Guided tours may be scheduled for scout groups on a Saturday, during the summer months or on school vacations. Reservations must be made at least three weeks in advance. Designate the number of scouts that will be participating in the tour and their ages. A leader and assistant leader will be admitted at no charge. Other adults attending will pay the regular admission fee. The fee for a group of 10 to 15 scouts is $80 plus 6% tax payable in advance. The fee for 16 to 30 scouts is $150 plus tax. A 90 minute tour includes viewing a 15-minute film on the Southeastern Indians. Scouts will go into the Hall of the Ancients and see how Native Americans lived long ago. They will see artifacts and the guide will discuss archaeology. They also visit the Longhouse and their guide will talk about the deer skin trading in Georgia. Time permitting, scouts may also play Native American games. November is Native American Heritage Month and the Funk Heritage Center schedules a Saturday to hold a free public event honoring Georgia's first people. Scouts are encouraged to make arrangements for this event that includes many opportunities to learn about Georgia's Southeastern Indians and special programs of interest to scouts of all ages. A 2 hour tour will include the above program and weather permitting, the group may also visit the Appalachian Settlement. The scouts will go into a historic log cabin and learn how sorghum syrup was made. 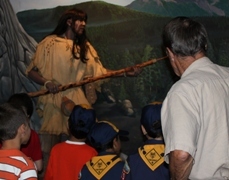 Tours for older Boy Scouts can include a tour of the Sellars Tool Gallery. Girl Scouts may want to tour the Rogers Art Gallery. A variety of programs are offered to meet the needs of a group and their merit badge requirements. Please contact Amy Baker at 770-720-5060 or Martha Hout at 770-720-9222 for additional information and to make reservations. Please make your check to: The Funk Heritage Center of Reinhardt University. Mail your check to Funk Heritage Center, 7300 Reinhardt Circle, Waleska, GA 30183. You can download previsit materials here.